After upgrading my parent’s company’s servers, I found myself next to a very loud, hot server. To remedy this, I decided to watercool the servers. To begin, lets first look at the return manifold. 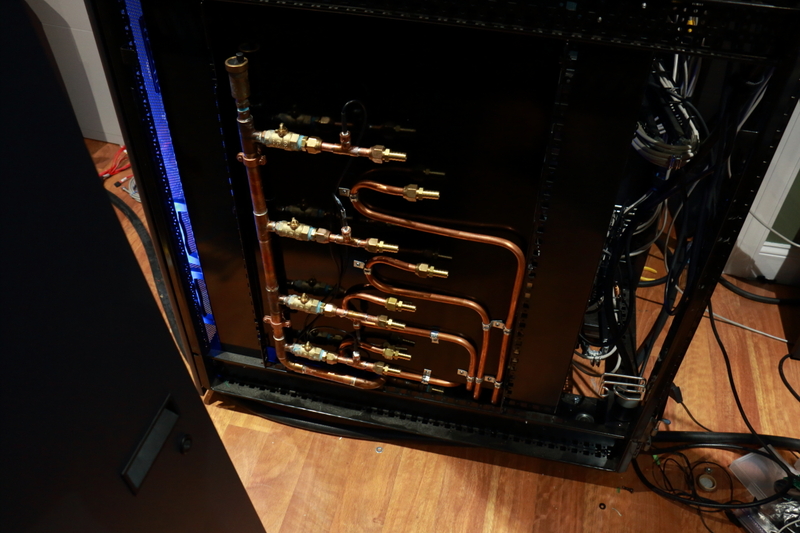 The return manifold is made of 3/4″ copper Tees. After the Tees, there is a ball valve, The ball valve allows me to isolate each server. This is helpful if I need to add or remove a server from the water cooling system. After the ball valve, there is a 3/4″ npt to 1/2″ flare, a 3/8″ tee, and finally a 1/2″ flare to 1/2 barb. The 3/8″ tee is for a temperature probe. The flares allow me to easily remove a server without cutting the tubing. Since were talking manifolds, lets look at the supply manifold. 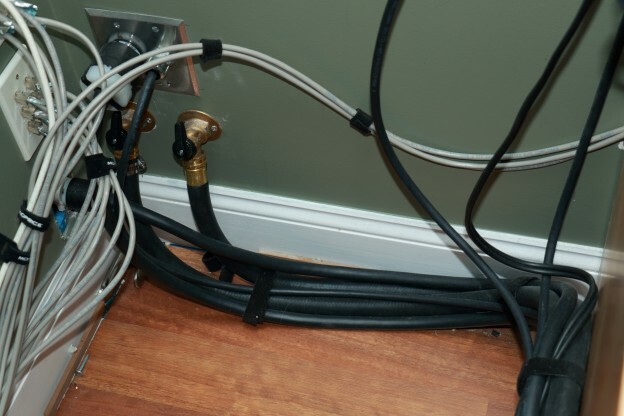 This manifold was originally meant for infloor radiant heat. It was free, which means that it was sitting in the garage. 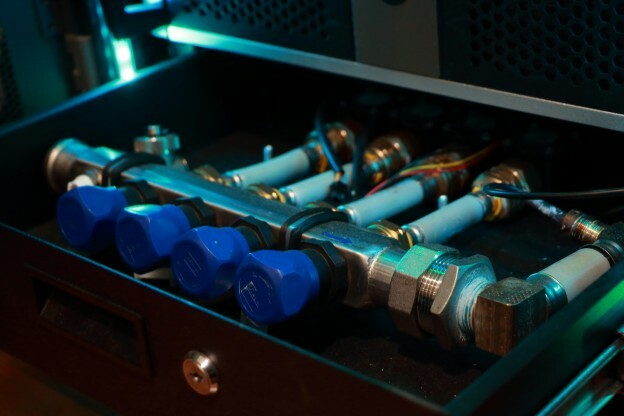 This manifold has proportioning valves for each output. Beside completely cutting off water to each server, this valve allows me to adjust the flow to each server. So if one server produces more heat, I can easily send it more water to compensate. 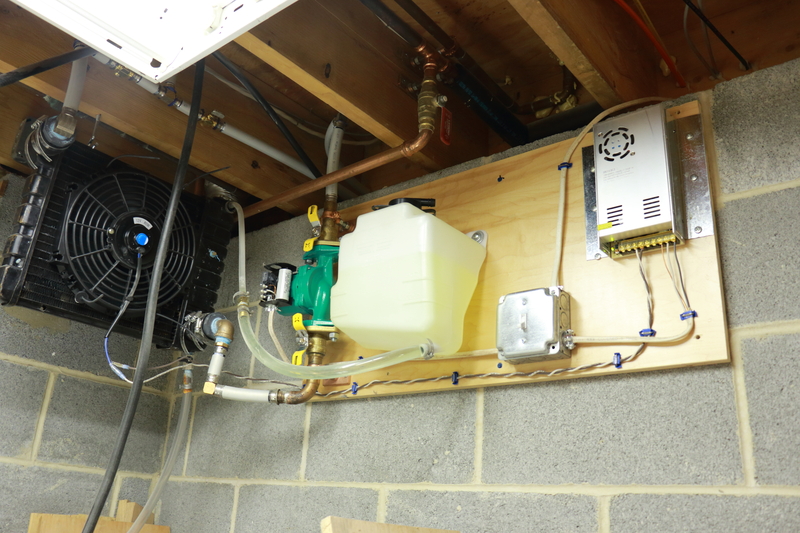 To monitor this flow, I installed flow sensors after each output of the manifold. These flow sensor have a stupid G3/4 thread. Luckily, I was able to find a NPT 3/4 to G3/4 fitting on ebay. This allowed me to attach pex tubing from the manifold to the sensors via a pex to 3/4 NPT. After the sensors is a G3/4 to metric barbed fitting. 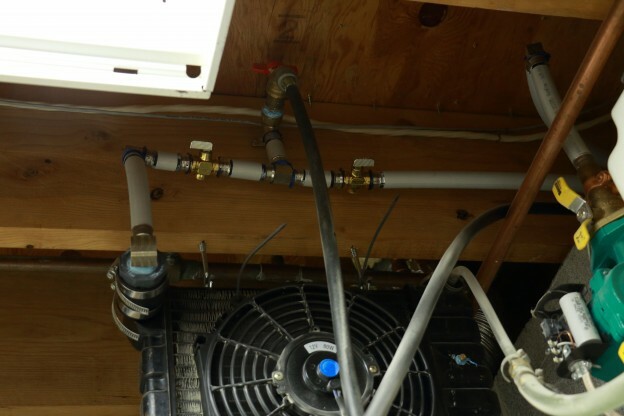 While the fitting is metric, it was close enough to 1/2″ that 1/2″ tubing would fit without an issue. This is the pump station and radiator in the basement. The radiator is meant for a small engine. This is not the first time that this radiator was repurposed for watercooling. I used this radiator for many years on my computer. I originally got it from surpluscenter.com I connected the radiator to the joist via 2 lag hooks. The radiator has two mounting holes on the top that thread onto the hooks. The reson I hung it, besides it was easy, is to protect it. If somthing were to hit the radiator, allowing it to swing would reduce the damage inflicted onto it. The radiator is plumed in via two Ferncos. A firmco is basicly a short rubber hose. It is mainly used in the plumbing industry for drainage applications. The pump is a standard 110v circulating pump. I am hoping to change this out to a 220v circulating pump so that it can be controlled by my pdu on my rack. The car coolant reservoir sitting next to the pump is connected to the overflow port on the radiator. My idea behind this is that if I add a server to the system, the pump can draw fluid from the reservoir via the radiator cap. The power supply on the far right of the piece of wood is there to power the 12v car radiator fan. Both the power supply and pump are ran into a switch. This is so that I can turn them off if I am working on it without having to go upstairs. I plan on putting a safety cover over this switch later. To go from the server rack to the wall, I used a garden hose. The garden hose goes into boiler drain spigots. This allows me to disconnect the entire server from the water cooling system if needed. I used boiler drain spigots instead of normal garden hose spigots because boiler drain spigots utilize a ball valve. This type of valve allows a much higher flow rate over a normal spigots. 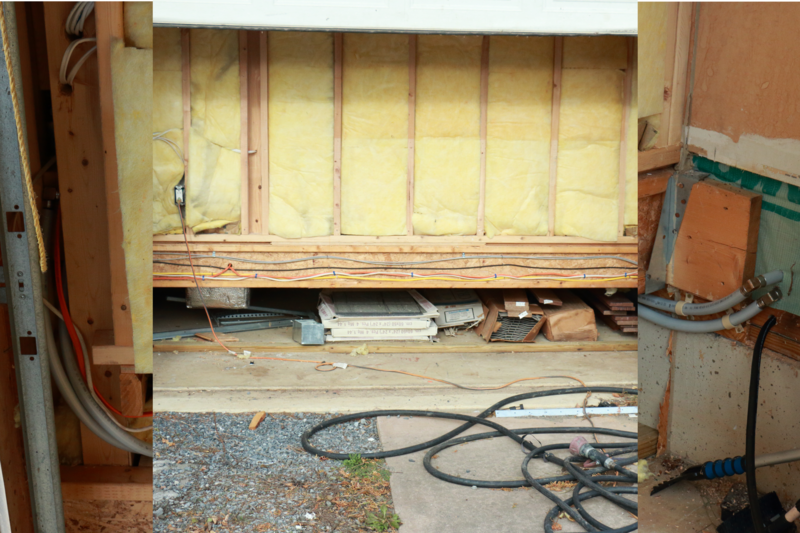 To go from the spigot (on the left) to the basement (on the right) I used FostaPex, a version of Pex tubing. Using pex over copper has on huge advantage. Pex is flexible. This means that I don’t have to sit there soldering in a bunch of fittings. I just run the pex like a really big wire. The difference between FostaPex and normal poex is FostaPex has an aluminum shield inside of it. This prevents oxygen from entering the circulating water and rusting out components. In the basement, the tubing part ways, going to the radiator and the pump. The pipe going to the radiator has an injection port for filling. When I go to fill the system with coolant, I attach a pump to a boil drain spigot. Then I close off the valve closest to the radiator and push the coolant through the system. This allows me to get rid of most of the air in the system. It also pre primes the pump. I needed waterblocks that would fit onto a LGA771 socket. Unfortunately, I couldn’t find any. 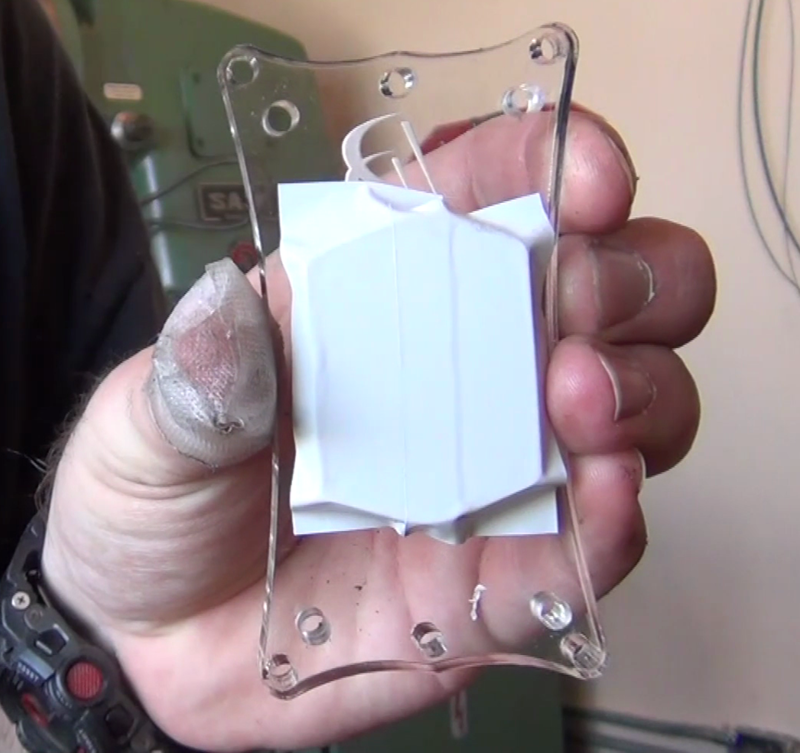 So I started to mill an acrylic top for a waterblock that I had laying around. Unfortunately, I grabbed the wrong dimensions online and the new top didn’t fit the heatsink mounting holes. I was going to try the same thing with the correct dimensions, but then I found some water blocks online that were dirt cheap. 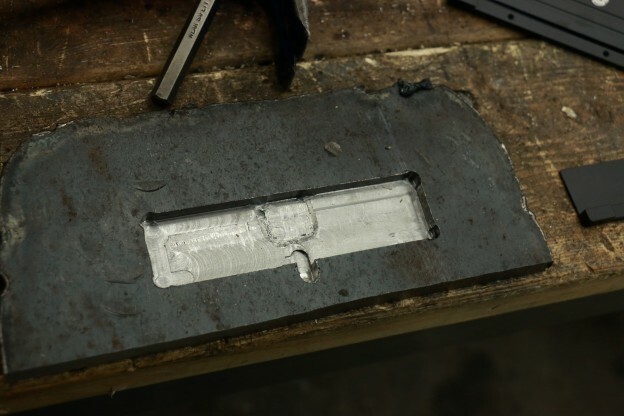 The mounting holes fit perfectly on the waterblock, so I threw the block into my mill, and with the correct dimensions, drilled 4 new holes into the top of the water block. My nas contains 8 sticks of ecc ram making for a total of 32GB of ram and a lot of heat. I wanted to cool this down, so I bought some ram water blocks. Unfortunately, they didn’t fit. ECC ram has an ic on it. The stock heatsink has a bulge on it that accommodated this ic. The waterblock version didn’t have this because they are designed for desktop memory. To remedy this problem I decided to mill out a die. 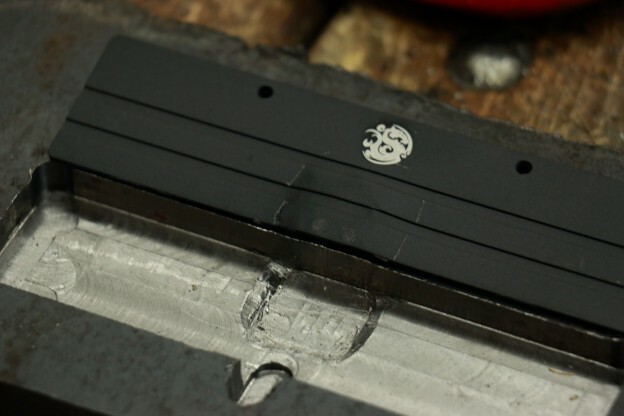 I first milled out the profile of the waterblock in a piece of steel. Then I milled out the divot that I wanted to add. Then I milled out a slot the would allow me to pop the waterblock out of the die. Then I took a flathead screwdriver and scraped the corners of the divot down to form a gentle slope. To use, I clamp the heatsink into the die. 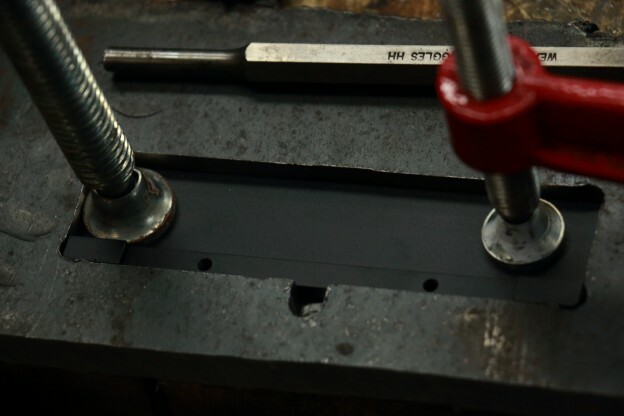 I then take a roll punch and gently hammered the block into the divot. I was going to make an upper die that would be pressed into this die to form the bulge. This would have been cleaner and more accurate. However the amount of time that it would have taken to make was not worth it for 8 water blocks. The waterblock fit fairly well onto the ram. There was a little bit of space between the ic and the water block which I filled in with thermal paste. I know that this isn’t good practice as thermo paste isn’t very thermally conductive, but I only need the ram to stay cool. I am not trying to overclocking the ram or attempting to get ridiculously cold ram.